Guys! Today is a very exciting day. Wanna know why? 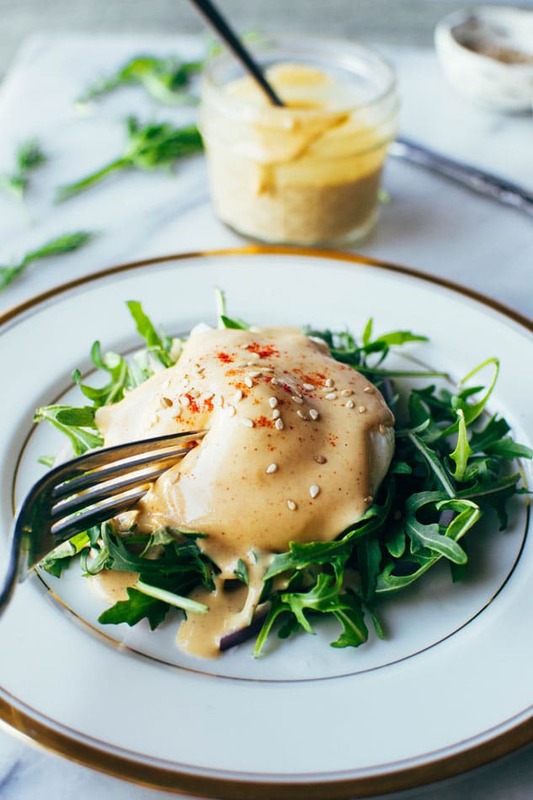 Because I’m sharing a recipe with you for easy DAIRY FREE tahini hollandaise sauce! AND it’s delicious! AND it can be made in a blender! The list of reasons to love this sauce goes on and on. Sauces, in general, are a pretty big deal to me. From my perspective, the variety of sauces in my refrigerator are just as important as the variety of veggies. Sauce is like the magic wand that can turn any simple thing into a truly mouthwatering food experience. I’ve been working on a recipe for a mediterranean eggs benedict recently (coming soon! ), and while posting some process shots I got a request from a friend for a butter // ghee free version of a hollandaise sauce. I hadn’t been planning on going completely dairy free with the hollandaise for that recipe (and I’ll still probably include two versions of the sauce in the final recipe) but it got me thinking about some different ways to make a hollandaise sauce without dairy. Because even dairy free peeps deserve a bomb hollandaise sauce. 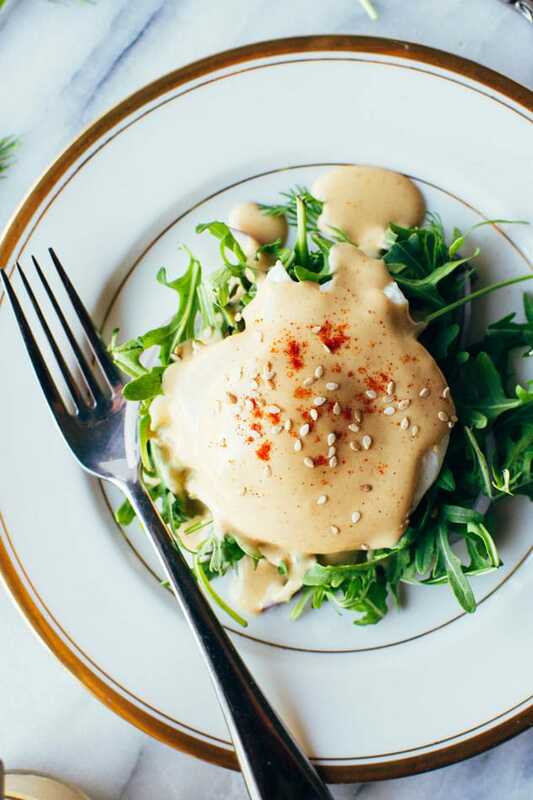 And since I had already been planning on sneaking in some tahini to my original hollandaise – I thought, why not try swapping out the butter for tahini completely? Aaaand it totally worked beautifully. I have eaten it over many a poached eggs and feel pretty confident that you’re gonna love it. Full disclosure though, (cuz we trust each other like that) it doesn’t have exactly the same consistency // flavor of an OG hollandaise, but it’s pretty close, and the flavor that’s there instead of the classic one is pretty darn stellar if you ask me. 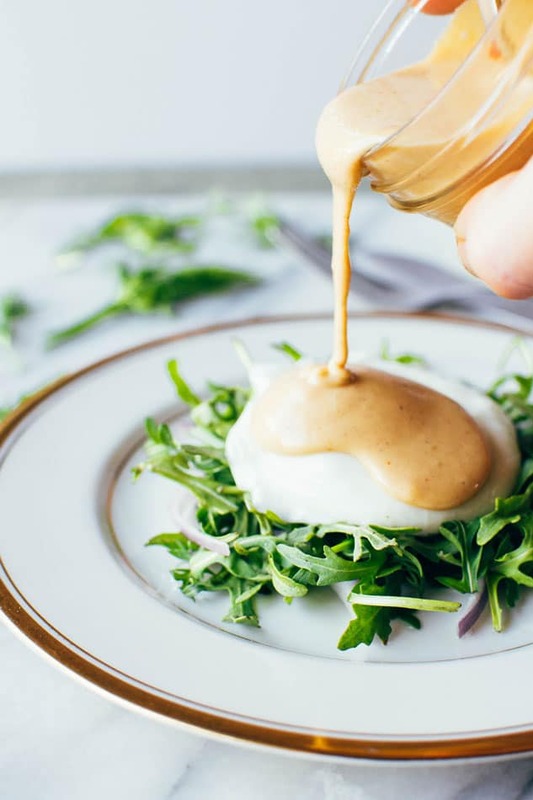 The tahini shines and there’s still that delightful rich and tangy smoothness that we all love so much about hollandaise sauce. 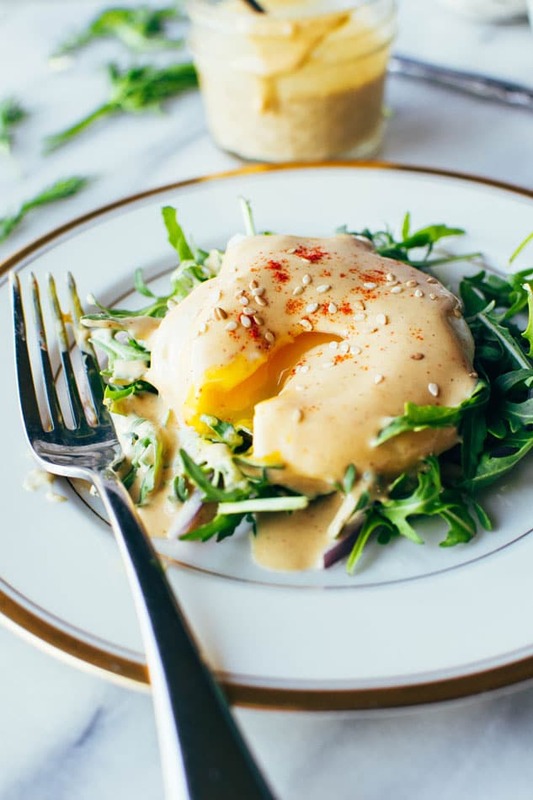 Just like a classic hollandaise, this sauce will thicken as it cools, so it’s best to make just before you’re ready to drizzle over whatever incredible meal you have waiting for it. I also have an awesome trick in the recipe instructions that I picked up from the knowledgable mama over at Against All Grain for keeping the hollandaise a great texture from the very beginning. If it does start to thicken up too much before you have a chance to pour, just add a tiny bit of hot water to the blender at a time until your desired consistency is reached. It’s really that easy. 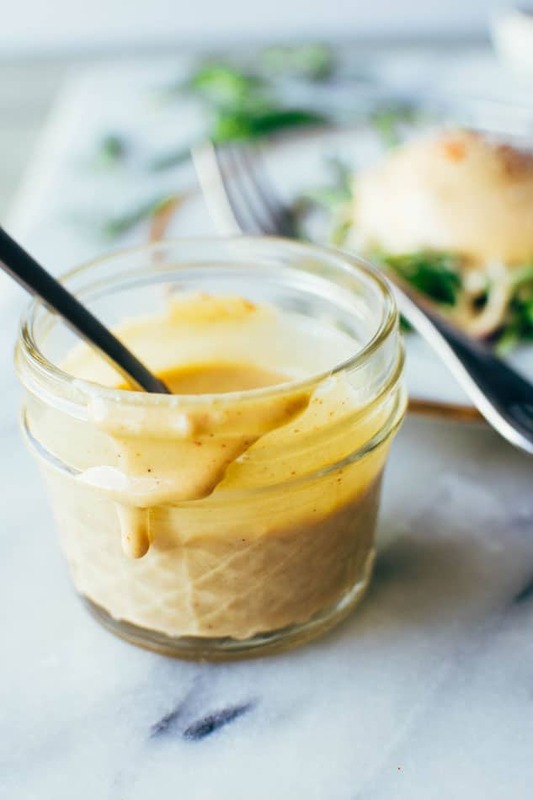 Easy dairy free tahini hollandaise sauce! So simple to make (in a blender!) and still full of healthy fats and delicious flavor for your endless list of things that you have just been waiting to drown in hollandaise goodness. Heat up at least 3 cups of water. Pour about 2 cups into the blender you will be using to make hollandaise and let sit for about 5 minutes to heat up the blender while you gather the rest of your ingredients. Dump out water from blender and add egg yolks, lemon juice, salt, garlic powder, paprika, tahini and about 2 tablespoons boiling water to start. Blend on high until well combined, stop to check consistency, and add hot water, about 1 tsp at a time until desired consistency is reached. I used about 1 tablespoon more of hot water after the initial 2 tablespoons. This amount will really all depend on the original consistency of your tahini. Season to taste with salt and lemon and serve immediately keeping in mind that this hollandaise will get thicker as it cools just like a regular hollandaise! If it does begin to thicken to much you can easy thin it again by adding a tiny bit of hot water and blending once more before serving. This entry was posted in breakfast, dressings & sauces and tagged breakfast, easy, gluten free, grain free, healthy, paleo, quick, sauce, vegetarian on March 1, 2017 by Nyssa Tanner. Awesome!!! I hope you love it ☺️ I would love to hear what ya think!